I want to give a HUGE thank you to the editors of Freshly Pressed for featuring me and all my new readers and to everyone who liked and commented for all the kind words and support. What an honor! It means a lot. Really. I had no idea what to expect,and my head is still spinning. Thank you to everyone for being a part of my seventh really-truly-deeply-happy moment! I will treasure this forever! This whole experience got me thinking. I began to reevaluate my goals and plans and my general intentions. After some serious thought, I’ve decided to give the blog a minor make-over to reflect this (just an update or two to the About Me page). I write as I always have: because I have something to say, because I want to leave something to be remembered by, because I can write things on paper that I can’t say out loud. I write because my silence is over. I’m amazed and delighted that what I had to say resonated with so many people. I hope that this will stay true for the rest of what I have to share (because there is, oh, so much more). I hope I can encourage all of you as much as you have encouraged me! And also, because I have unexpectedly found myself in need of a new goal, I would like to announce that my first book is in the works! Now, I am not sure how long it takes to write a book — I’m sure it’s different for everyone — but I will post updates as it progresses. Hold on to your hats, people. The best is yet to come! Hedgehog in the Fog is a short animated film from the 70s, written by Sergei Kozlov. There is also a book by the same name. From what I gather, the hedgehog and the bear cub drink tea, count stars, watch sunsets, and generally muse over autumn and the beauty of life. Even though they are very different, they are the best of friends whether they understand each other or not. I want to say it is the most adorable thing I have ever seen, but that would not be quite accurate. “Entrancing” is more like it. When I first saw the film, I felt as if I had found a missing piece of my childhood. It was fascinating, with an uncanny hint of the familiar. Perhaps I was struggling to recover memories from a parallel me in a parallel universe. Or maybe I enjoy my Sci-Fi a little too much. At any rate, I found myself trying to imagine that other world in my mind, 5,000 miles away and 8 hours ahead, a world where little Eastern European kids grew up on these stories while I was reared on Gumbi and Bambi. I tried to picture how my life might have been if I had been born “over there”, instead of “over here”. It was a curious and generally futile exercise, but I still tried. Then I tackled the book. It was right up my alley, all fog, mountains, sunsets, and twilight. About sitting in the gloaming and watching night fall. I love all these things. But autumn has always made me sad for some reason I can’t explain. In these stories, it always seems to be autumn. Sometimes, it leaves me wishing for friendships like that. Maybe I have them, but at times my friends all seem so far away. We all live in different states or different countries. Maybe in fact it is the distance that brings us close, all the possibilities of the times we could have spent together, if situations were not as they are. Maybe I already have a friend like that, but I’m sitting too close and I can’t see it. Perhaps I won’t really appreciate it until it’s gone. What makes for sweet and charming tales on paper (or e-book) might not be so in practical everyday life. I have to remind myself of this. All that being said, I connect to this story in a way that my adult mind does not understand. But the little girl inside me, the one that treasured her stuffed teddy-bear and stuffed hedgehog, remembers. And she is devouring these stories and animated short films with child-like voraciousness. Personal musings aside, Hedgehog in the Fog (Yozhik v Tumane) is really cute. It’s short, only about 10 minutes long. The above video even has English subtitles. Oh, I don’t expect anyone to have the same emotional reaction to it as I do. But it really is a gem of a movie. It even won awards! No excuses now. Go. Watch. Enjoy! 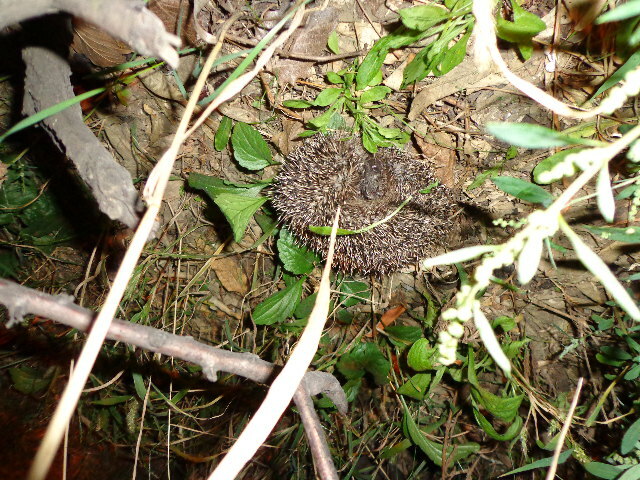 I saw lots of little hedgehogs in Kyiv, but I was never fast enough to snap a good picture. The quiet of the park belies it’s past. It seems impossible that anything awful could ever happen here. 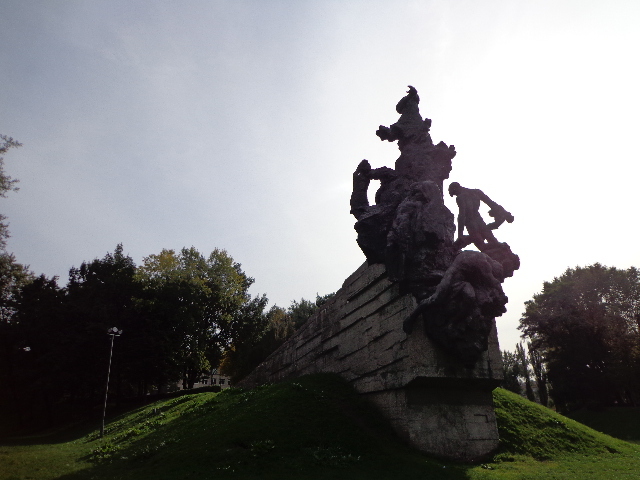 But this is Babi Yar. This is a place out of a nightmare, a site of mass murder, horror, and hate. But on this day, it was peaceful and calm. People covered the steps of the monument in flowers — things of fragile, fleeting beauty — wishes and memories. This is how we honor the departed. We remember. We pray to God it never happens to us or to our children. And for as long as we live, we keep moving forward. This morning was grey and icky. I was awake half the night with a cough. I took one look out the window this morning and thought, “Maybe I shouldn’t have changed my ticket after all…” Originally, I was to have left yesterday, but for one reason or another, I pushed my return date back 5 days. Now much more stressed and several hundred dollars poorer, I wondered, “Why exactly did I think that was a good idea?” I finally managed to drag myself out of bed, wrap up in my Ukrainian coat, and brave another moody day in Kiev. I told myself, “I need Wi-Fi. I need Wi-Fi. I need… Oh! Pizza!” Yes, the bakery had pizza again.